EMPLOYMENT services advisers from Jobs and Benefits offices in Downpatrick visited Ulster Supported Employment Ltd headquarters in Belfast last week to find out more about Workable NI, the flexible programme which helps people with disabilities or health-related issues into employment. USEL, Northern Ireland’s largest supporter of people with disabilities and health related conditions to get them back into open employment and the leading provider of into-work programmes for those with health-related barriers to employment, welcomed 80+ attendees including employment providers to its Cambrai Street head office in North Belfast to showcase the success of the scheme in action. 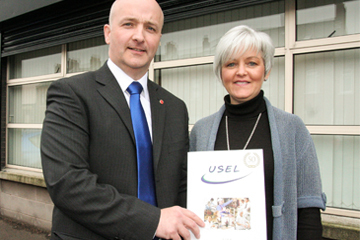 Sonya Curlett, Downpatrick Jobs & Benefits Office, discusses with USEL Chief Executive Sam Humphries the job opportunities in the Downpatrick through Workable NI. Speaking to frontline staff from Jobs and Benefits offices from across the greater Belfast area, Sam Humphries, Chief Executive of USEL, emphasised the value of the scheme. He said: “In today’s economic environment the prospect of job hunting can seem daunting and often disabled people or those with health-related problems can feel at particular disadvantage. Workable NI offers them the practical and highly focused support they need to build both confidence and skills and set them on the road to long term employment. The scheme gives candidates the opportunity to go into the workplace, where USEL works with the employee to provide them with continuing, personalised support and encouragement. The presentation day was one of the second of three regional events initiated by Disability Employment Service to build awareness of the scheme and the providers.